Having now had the chance to walk the show floor quite a lot (personally, I’ve been over 22K steps since Wednesday) this year’s InfoComm is looking to have been quite the success. From seeing the NAB-esch registration lines on opening day, to the extensive crowds swarming the Harman, Crestron, Christie, Sony, Biamp, etc, etc. I could seriously go on and on with a list of booths that you had to almost elbow your way into. I’m intrigued to see if this continues into Friday because it’s been incredible busy up to this point. I spent Thursday on the floor looking for a few items that would catch my eye. As usual there were goodies to look at everywhere, but nowhere was that more apparent then in large format displays. 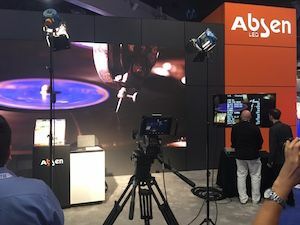 I couldn’t help but stop at the Absen booth as they had their LED wall products showing not only a seriously fantastic LED wall but more importantly by showing the display coupled with a broadcast ready camera and reference monitor, attendees were able to see the quality of the display in real world recording applications. This is an application reference that is usually reserved for the NAB crowd but as our space continues to require more high quality solutions utilizing video walls and IMAG or video content creation, the quality of the recorded screen imagery is paramount. This is part of a larger trend that we keep seeing at InfoComm, where we are borrowing additional technology and applications from other industries and channels, such as this application from the pro video world. While walking around it still seems to be a video world in which we’re living, from the aforementioned Absen booth to the LG 55-inch OLED ultra thin bezel display that is actually shipping in four weeks. It’s the embodiment of years of expectations and excitement wrapped up into a beautifully thin package of digital signage goodness. Oh, and did I mention it’s shipping in 4 weeks? Only time will tell the impact that this product will actually have on the industry once it actually ships. LG was really pushing the boundaries of their display technology, and is continuing to show that with their OLED technology as well as their fantastic Arch OLED. This is one of those products that could potentially change the game for digital signage applications by allowing the integrator to use some creative prowess to not only the design of the content, but to get beyond the flat wall installation and really taking advantage of the space. The Arch will really let designers bring signage into the space and push the boundary between the content and the space. I’m always excited when we find ways to move beyond the basic 16x9 panel and really get into fun applications that create interesting nightlines and eye-catching imagery. Even though the display market has seemed slightly over-saturated and just not as exciting as in years past, I’ve been pleasantly surprised to see some great new technology coming to market, especially the fruition of OLED evolving beyond just a proof of concept into a tangible product that we can offer to our clients. We’re finally seeing all the possibilities that have been promised to us for year in real life and shipping for immediate consumption. I can’t wait to see where else this can go.